Xiaomi to Unveil Redmi Note 2 and Mi 5 on 15th January? After Xiaomi has teased that its next flagship will be “as thin as Cicada’s wings,” two new teasers have been released that seems to be pointing at a new Redmi Note 2 instead of the much speculated Mi 5. However, the second teaser shows a pair of hands “holding” two different smartphones, which could indicate that Xiaomi is unveiling more than one device this 15th January. Rumoured specifications of the Redmi Note 2 include a 5.5-inch 1080p display, a Qualcomm Snapdragon 615 octa-core processor paired to 2GB of RAM, 16GB or 32GB of internal storage, a 3100mAh battery, 13MP rear and 5MP front cameras, Android 4.4 KitKat with MIUI 6 on top, and get this: a curved glass back that is rumoured to be protected by the Corning Gorilla Glass. If you’re disappointed that the new “flagship product” isn’t the Mi 5, don’t be. The second teaser, on the other hand (pun intended), is a pair of hands that suspiciously look like they are holding two different devices with the tagline “double blessing has descended on the house.” Many are speculating that Xiaomi will be unveiling the Mi 5 along with the new Redmi Note 2. 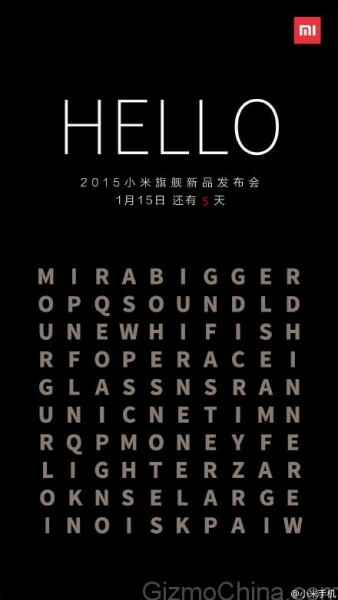 In any case, Xiaomi is building up a lot of hype with these teasers. Hopefully, the rapidly growing Chinese company won’t disappoint come 15th January.